me: i can't go out with you that night, i already have a date. some male i'm dating, let's call him jim: WHAT?? YOU HAVE A DATE WITH SOMEONE ELSE? me: yeah, her name is sarah. jim: oh, hot. can you guys stop by my place after? me: i don't even know her; it's a first date. jim: send me photos if you kiss her. me: er, do you want to make plans with me later this weekend? me: oh, i have yoga with george. jim: GEORGE? WHO IS GEORGE? IS IT A DATE? the above scenario is an invented one, but it represents about 193 interactions i've had. i call it "invisibility." there are so many things that are invisible in our society, that we don't give enough time, space, or attention to. when we allow things to be invisible, we reiterate that they don't matter; that the people who experience that context don't matter. however, placing a clear and specific focus on something highlights it and begins to build awareness and importance for it. and can be the beginning of a very different life for someone living that truth. september was bi visibility month, as in bisexual visibility. and, somewhat unsurprisingly, i didn't know that it was bi visibility month until it was almost over. where were my social medias on this one? where were the hashtags and inundation of articles and cute pics of couples? i work in sexuality and follow several sexuality and sexual health experts and nonprofits. how is it possible that bi visibility month was so invisible? 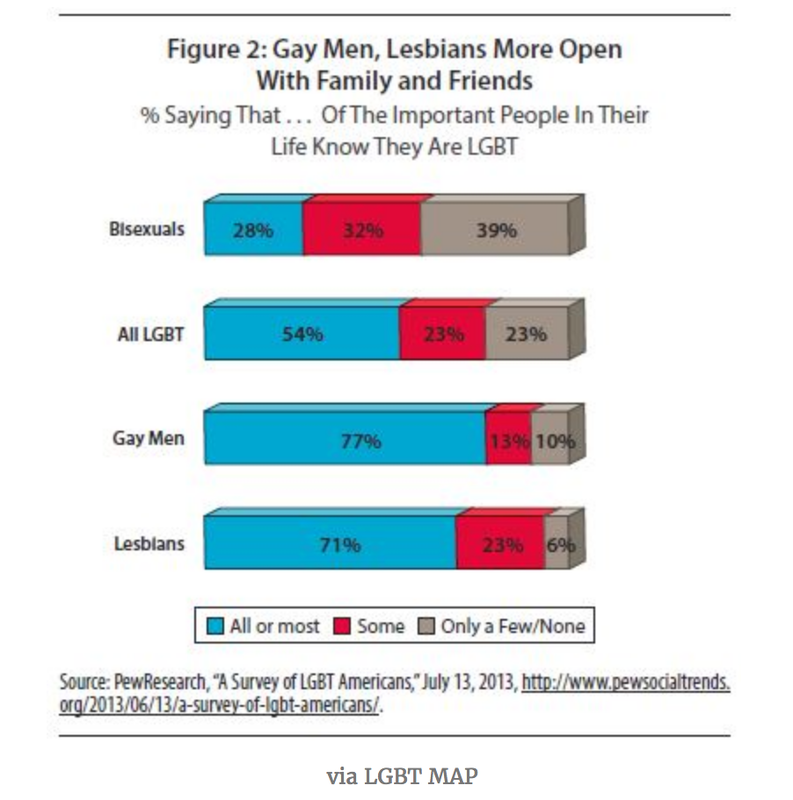 in health (mental and physical) research involving bisexuals, there is strikingly little information available: most research lumps bisexual-identifying individuals with homosexual-identifying individuals. this is the same as assuming that the whole world's population is similar to white men (which, by the way, is what medical research did for years). 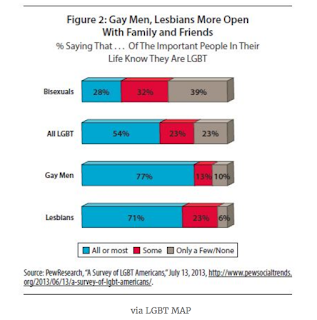 we do know that bisexual individuals have a much higher prevalence of mental illness, and i would argue that it is directly related to the problem presented here. ( ) when bisexual identifying individuals are with a partner of the same gender, bisexual people go through a lot of the things that homosexual people do: i've had family members not want to acknowledge romantic relationships as something "more than friends," co-workers that have made rude comments, and uncertainty about how to introduce a female partner in some contexts. and in these situations, most of these people are assuming i identify as homosexual. ...except by people who do identify as homosexual: they tend to tell me things like "you're not a real gay." ( ) when we are with a partner of a differing gender, there's an assumption that we're straight, that we identify with the heteronormative world, that we don't understand the "struggle." ( ) but i would argue what is most frustrating, for me, is how the men i date treat the actual or potential women partners in my life: most men i have ever been out with think it's "cute" that i date women; they don't consider my female partners "real" partners or threatening to them in any way. oh, and they fetishize the girl/girl kissing and assume they'll be invited to be a part of it. so, yes, no matter who i date, my sexuality is normally dismissed by most people around me. so, in honor of bi visibility, and of national coming out day (oct 11), i am writing this. maybe you didn't know that i was bi, despite the photos i post and terms i use. maybe you didn't want to admit that i was bi, despite things i've told you. and part of it could be that i don't normally use the words bi or bisexual to describe myself; i'm more likely to say something like "i'm open to relationships with people regardless of gender." but now you definitely know. so no more excuses. help make bi people feel safe, included, validated.